Over a millennia ago, during a time of peace and exploration, mankind's greatest undertaking led to the creation of the Stardrive, a device capable of instantaneous travel between two points in space. Massive Republic colony ships were constructed around them to carry the hopes and ambitions of their people to distant stars. Capable of only a one-way trip, decades were spent selecting planets for colonization. Soon, life was seeded across thousands of worlds in the fringes of charted space. Further advances in localized FTL engines bridged the gaps between neighboring systems and brought about galactic trade, transforming colonies into civilizations. As their territories began to brush against each other, it wasn't long before greed led to war. Centuries of savage conflict ravaged countless worlds and lost with them was much of the technology and knowledge of their forefathers. Cast into darkness and isolation, generations past with little hope of a brighter future, until word spread of a small fleet from whereabouts unknown trying to unite the colonies under one flag. 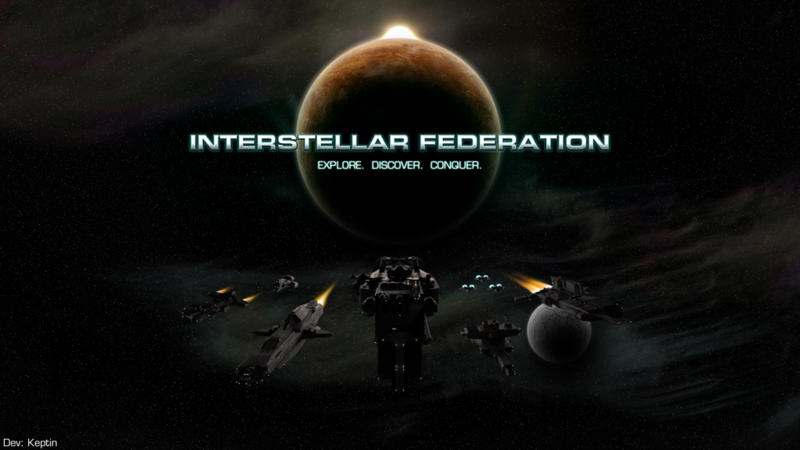 Through helping one another rebuild, this interstellar federation strengthened the galactic bonds more than they had ever been before and civilization once again prospered. It seemed as though nothing would threaten the peace everyone enjoyed until the discovery of omega particles drew the attention of a bloodthirsty alien race known as the Jardain.
. Just as advanced and with greater numbers, the Jardain swept through Federation space like a plague. With astute resourcefulness, Federation generals stalled the enemy as they realized a desperate attempt to develop a weapon that could turn the tides of war. Crippled and abandoned after forgotten skirmishes long ago, the once great Republic colony ships would rise again to protect the children of their builders. Contained within them was the most advanced piece of technology known--the Stardrive. Without the knowledge of their ancestors, repairing it was impossible, but Federation scientists were able to repurpose its colossal hadron reflector to create a devastating weapon. 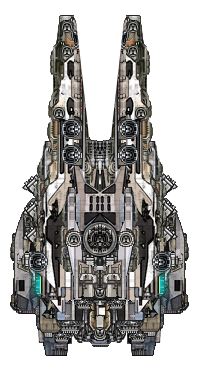 Living areas were gutted to fit power cells, cargo bays were packed with ammunition, sub-systems of sub-systems filled the decks and lesser ships were sacrificed to reinforce its armor. On the eve of year 2500, marking the anniversary when mankind had embarked on a daring life among the stars, the first Titan was born. -Incorporated balance updates & unique names, special thanks to LostInTheWired! -Fixed Helios and Montana crashes caused by bad AI in .system files. 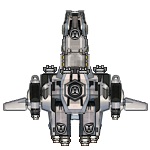 Note, "SYSTEM" weapon mounts have been added as needed, please update all IFed .ship files for mod compilations. COMPATIBLE WITH STARFARER 0.6.1a, Thanks Kazi! Vanilla balance is a priority; feedback is appreciated! Re: Missiles Inc. - taking missile mod requests! that's a big missile you got there. No, keptin's just happy to see you. Seriously, though, this mod looks promising. Satanic, fast-moving, loaded-to-the-gills-with-BOOM seeking weapons are most welcome. A heavily armored low velocity missile with punch. I'm talking speed ~25 or less with hp in the thousands. Is it possible to design a missile-type weapon that, in place of an explosive payload of any kind, instead mounts a one-shot version of a starship weapon? Said missile would wait until it reaches a certain (fixed) distance from the enemy, then starts firing the weapon at the target unit at that instant, and continues for a certain (again, fixed) number of shots until the missile is hit by enemy PD systems or it exhausts its onboard power / ammo magazine and it is then removed from play. The embarked weapon aboard such a missile will depend on its size. A small version might just have a Railgun or an Ion Cannon, both with a very limited duration of fire once they reach the triggering distance to target. At the other end of the scale, the large version of this missile might have a the ability to fire 5 to 8 Hellbore Cannon rounds or say ten seconds' worth of Storm Needler flechettes in a continuous stream. This might be quite a big modding challenge, but it would create fascinating new options in the game. Sounds like a sweet idea, but I have absolutely no idea how to implement it. The api is great, but we're still pretty limited. I really wish we add new sounds and fire effects (i.e., beam types, explosion fx, etc.) and for missions, add time/event based events (i.e. dialogue boxes that pop up during combat, enemy/friendly unit spawns, etc.). The tweaking part of the mod is going to lag behind for a few days as I build a pile of sprites to use. Going back and forth and playtesting for each weapon kills my flow, but I'll post sprites here as I make them. Yeah, nice work this seems to be , any chance you could do something that's more closely related to the game art it self than having Sam missiles? still keep up the good work. Beam missiles are planned for future updates IIRC. At least i do remember Alex`s post about graphics for such missiles already done. As to missiles. I was trying to create am Area of Explosion med range anti-fighter missile, but normal missiles doesn`t work with Proximity_fuse and MIRVs with bomb warheads with proximity fuses did no damage to ships and fighters (fixed in 0.52). Also a EMP MIRV was another my idea, but emp could not be currently applied to warhead (also fixed in 0.52). 1. cluster torpedoes that releases multiple bomblets in close proximity (remote minefields etc.). 2. cruise missiles that deal torpedo-like damage, has great range, are armored, but slow. When getting near its target a smaller, faster and more agile warhead separates from it (drives work for a short period of time). 3. burster torpedo with proximity fuse. Releases slugs much like sabot missile, but in all directions. 4. energy torpedoes and missiles with area effect and without it. 5. a missile that simulates a weapon. MIRV type with empty projectile that is actually another MIRV doing the same thing. Could simulate any autofire weapon. Very cool, I'll look forward to .52 even more! I've been toying with some similar stuff, but it's just not there on the modding side. All of this reminds me of Tiberium Sun; there were some crazy weapon mods for that. @Upgradecap, hey, great idea...what's stopping you? :/ I post four things and already there are critics. I'll get there, but right now I'm flushing out sprites that I'm in the mood to make; I've got some ideas for a new race (terrain/federation/"american race"-feel) that I'll wrap this stuff into. Though, you have a point; I've got to adjust the levels and tweak a few things to bring out those hard edges. *edit*- Aww yeah, hard edges. Much better. I take it back, that comment was more constructive than I thought. Is it possible to design a missile-type weapon that, in place of an explosive payload of any kind, instead mounts a one-shot version of a starship weapon? Sounds like a sweet idea, but I have absolutely no idea how to implement it. The api is great, but we're still pretty limited. I thought about my request in more detail, and then decided that I should take it to the next level entirely. Whole new thread about it here on the Suggestions forum; please stop by and share your thoughts! Really, Okim? That is awesome times eleventy-one! Perhaps the formal proposal I just made in that linked message will nudge Alex's own concept somewhat. Keptin, looks like you've certainly got no shortage of missile ideas heading your way. I'll put on my thinking-cap and see what I might be able to add to the mix. Just thinking of how exactly are beam missiles going to work? Did you read my formal proposal here? I went into considerable detail about the gameplay mechanics of such a thing -- check it out. I went well beyond just beams alone on those missiles. @Archduke, I frickin' love missiles! If said features are implemented in .52, I'll go to town...sprite town. @Upgradecap, Cool! I want to bash out a ton of sprites of numerous "races" while keeping with the games art style to a degree. I'll take a look at your mod for some thematic ideas.